The latest version of our bingo card creator software, Bingo Card Printer, comes with hundreds of ready-to-use bingo activities and games, including a ready to use set of Multiplication Medium bingo cards. You can print and use any of these bingo activities exactly as they are, or you can use them as a template for your own projects - by adding your own items, deleting unwanted items, customizing colors and fonts, etc. Click Create New Bingo Card Project... (or click New... on the File menu). A dialog box will appear. Click the Math tab. Select Multiplication (Medium) by clicking it with the mouse (you may need to scroll through the list), then click OK (or simply double click on Multiplication (Medium)). You are now ready to print your bingo cards, or you can customize them (using colors and fonts, by deleting unwanted items or adding new items, changing the bingo card size, etc.) before printing if you choose. This list contains 121 items. If you download the free trial version of Bingo Card Printer, you can generate bingo cards containing these items immediately. The free trial version allows you to customize the bingo card size, header, free space, fonts, and colors. If you Register your copy of Bingo Card Printer, you will also be able to customize the list of items, by removing any unwanted items, or adding your own additional items. If you select this bingo template: The software will initially generate a set of 5X5 bingo cards with a free space in the center square, but you can turn off the free space if you wish. You can also generate 3x3, 4x4, 6x6, or 7x7 bingo cards from this item list if you wish. 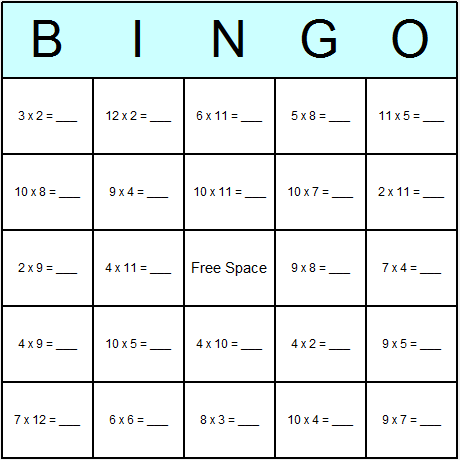 If you would like to see a bingo game produced using this template, containing 8 bingo cards and a call sheet, please download multiplication-medium-bingo-cards.zip. The ZIP archive also contains the BCP settings file which you can open in Bingo Card Printer to customize the project, as well as a README.TXT containing the License grant and other information. These Multiplication (Medium) bingo cards are one of 37 activities in the Math bingo cards templates category.